BOSTON, February 24, 2015 – Single-family home sales in Massachusetts fell almost 2 percent in January, marking the first time sales have decreased since September 2014, according to a new report from The Warren Group, publisher of Banker & Tradesman. January home sales in the Bay State decreased to 2,685 from 2,736 in 2014. This was the lowest number of sales reported since February 2014, when 2,078 houses were sold. The median sale price of a single-family home in Massachusetts in January increased 1.6 percent to $320,000 from $315,000 last year. This is the fourth consecutive month that median prices have increased. Condo sales for the month fell to 1,031 from 1,145 in 2014, a 10 percent decrease. 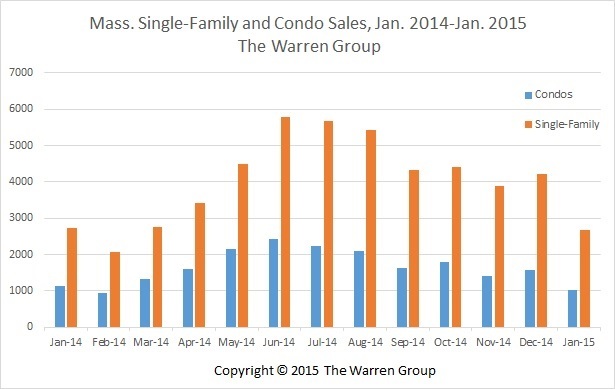 This was the lowest number of condo sales since February 2014 when there were 947. The median condo price in the Bay State remained unchanged at 299,999. In January 2014, the median price for a condo was $300,000. The Warren Group offers a range of real estate products, information services and printed publications, including Banker & Tradesman and The Commercial Record. The company also presents and organizes trade shows and events for a variety of industries, including bankers, mortgage brokers, credit unions and lawyers. Based in Boston, the company was established in 1872 and is now in its fourth generation of family ownership and management. For more information about The Warren Group, visit www.thewarrengroup.com.